Readers of the blog know that I've hinted at a big announcement over the last week or two. It's now time for the official unveiling! Last fall, I created a random hireling generator. This generator found its origins in materials pieced together from forums, websites, and blogs, and was restructured and revised with my own personal thoughts. I subsequently added a random name generator based on a set of prefixes and suffixes. I tried to pay homage to Gygax, Arneson, and others within. Both were downloaded a ton from Scribd. Not long thereafter, I started talking to Cr0m, one of the DMs at Red Box Vancouver, who took an interest in the above resources. The two of us cobbled some free time together over a couple months and developed a web-version of the combined hireling and name generators for use by the OSR community. The new generator is designed for classic fantasy and as such is compatible with OD&D, Basic, 1E and their retroclones. The new generator includes new Old School art that refreshes each time you visit the opening page. The generator includes over 1600 possibilities for human names alone. We returned to the articles in Dragon Magazine as a guide. Please use the comments section below to tell us what you think and suggest and revisions to the generator. Please spread the word through your groups and communities on the web. I'd like to thank and give primary credit to Cr0m for his time and web expertise to this project. I've made a good friend. Without further pomp or circumstance, we give you Meatshields! The Classic Fantasy Hireling and Henchman Generator. Painting my MegaMiniatures skeletons helped me get back into the swing of things and allowed me to develop my own painting "recipe" for skeletons. My approach has been to start small and/or to start with monsters - get all my mistakes out of the way - and then settle into a groove for painting adventurers. I anticipate sending more time painting those figures than your rank-and-file evil-doers. I've also bought a ton of 1980s Citadel miniatures for painting down the road. The Citadel figures are nigh-unto-perfect for D&D. The dwarves are exactly how I imagine them in my game. I also prefer the adventurer look to them, rather than looking like overdone hero types. Pictures of those will be far down the line. I came across MegaMiniatures early last year. I didn't order from them initially, but I did sift through their catalogue online several times. Subsequent to that I read a post on Dungeons and Digressions wherein the author ordered some skeletons. They looked great in addition to excellent service and fast shipping. I put an order in last fall for a group of PC types and posted here that I had a very good experience and really liked the miniatures. Nice crisp figures with minimal mold lines. Since that time MegaMiniatures opened an online storefront. I placed a second order, this time for skeletons and PCs. There's a bit of a backstory to that purchase, as I tried and tried to paint skeletons as a teenager but my figures always sucked really hard (they were really, really terrible). So, I decided to rectify that wrong and, since I started painting figures again, I put skeletons at the top of my list. To be clear, I'm not affiliated with MegaMiniatures and I don't know John. All I can tell you is that they have great miniatures at low prices and have outstanding service. I just placed a third order. They now have flat rate shipping. I can recommend MegaMiniatures to you (again) without reservation. Here's some of my recent work. Keep in mind I've had a lay-off of a couple decades. I'm still learning and making mistakes. Let me know what you think. I'll post in the next couple days about my DIY lightbox and some Otherworld skeletons and Stirges I've painted. I've also been working on a double-secret project with another Red Box Old Schooler that we will release to the OSR shortly. We aren't letting the cat out of the bag yet though, Mhuahahahahahahaha. I'm busy painting my orange-skinned Otherworld goblins and thought I'd pull this picture, mentioned in the comments, that I have in my collection but had forgotten. I appreciate both the early art of D&D but also the more "realistic" exactness of Keith Parkinson. 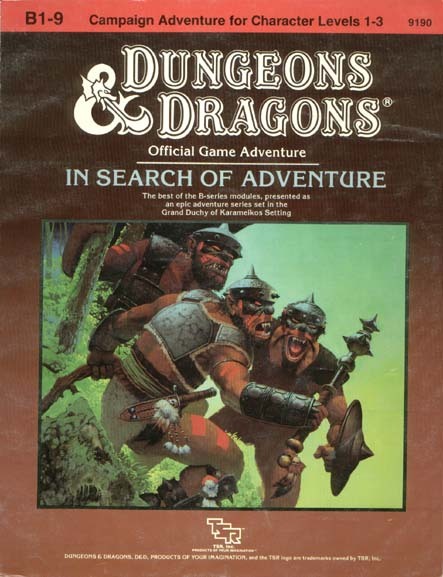 I played all the Dragonlance modules as they came out and have fond memories of Parkinson's covers on those adventures. Based on the descriptions from the MM brought forward in the previous post, I decided to paint an old Ral Partha goblin dull orange to see if the aesthetic "fit" and could provide a departure from basic green. I'm no professional photographer, but here are two pics of the Ral Partha goblin with a third beside an Otherworld goblin prepped for painting (side note: I've had this Ral Partha since the early 1980s sitting in an old cigar box). Please let me know in the comments if you think the look fits or not? Painting goblins like this follows the MM, but moves against the common convention of green goblins (side note II: I filed the base to make him into a slotta).